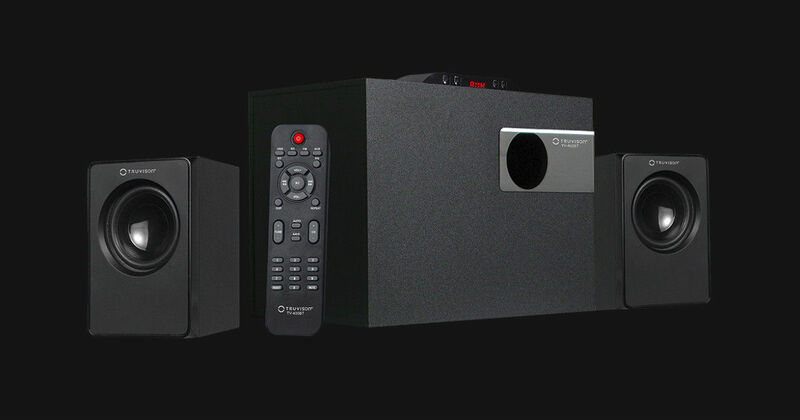 Truvision has launched an all-new 2.1 channel speaker setup, dubbed the Truvision 400BT. The speaker setup comes in the standard 2.1 channel format, with a dedicated sub-woofer and two satellite speakers. Furthermore, the speaker setup is Bluetooth enabled, and also comes with a remote controller to enable no-touch, fully handsfree operation. The total output of the Truvision 400BT 2.1 channel speakers is rated at 20W RMS. The sub-woofer is powered by a dedicated, 10cm x 1cm bass driver, enclosed in a wooden woofer chassis that is pretty much standard at this segment of audio gear. The monochrome LED display mounted on top of the sub-woofer unit, in between the USB and SD card input slots. The display, like many other multi-unit speakers at this price range, shows a rather rudimentary font to display the input mode selected, and while it may not be very aesthetically pleasing, it certainly is functional. The range of input mode options include aux-in, Bluetooth, USB ports for pen drives and SD cards, giving it a fairly comprehensive range of input interfaces to satisfy a wide range of users. There are, however, no optical audio port, which takes away any legacy compatibility with old television and DVD player units. The Truvision 400BT also includes an integrated FM radio player, rounding up the overall feature package. The overall finish is fairly simple, presenting a no-frills look to the overall unit. The Truvision 400BT is being sold across all major retail units, both online and offline, and Truvision has declared a one-year warranty on the product across all platforms. The speaker is priced at Rs 2,999, charging a slight premium over non-wireless 2.1 channel speakers due to the advantage of wire-free connectivity. While conventional 2.1 channel speakers have nearly become obsolete owing to the rise of non-desktop form factors as the major mode of content consumption, and excellent portable speaker options available at similar prices, the Truvision 400BT will attempt to address the niche audience that still consume content in a slight old-school way.